A good sling stone makes a big difference to the range and accuracy of a sling shot. In my experiments, I have noticed angular stones turning at surprising angles in the mid-flight, and I have always been more accurate with rounded stones. Stones found on beaches of certain types of rock have proved, though rounded, too rough and grippy; they leave the sling too late and crash into the ground a few yards ahead of me. Stones grubbed up from river banks have often been muddy and have sometimes slipped out of the sling early, flying high in the air, again to land a few yards ahead of me. I have never accidentally slung backwards - there is always some forward motion to the stone. 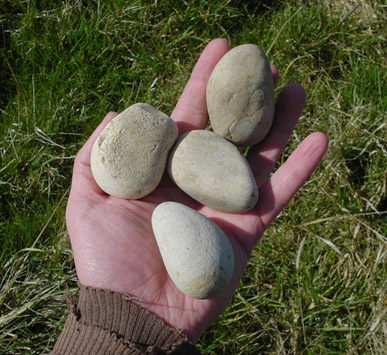 Dry smooth and rounded stones are best, which goes a long way towards explaining why hoards of good sling stones have been found in iron age hill forts like Maiden Castle. It also explains why people went to the trouble of making fired-clay sling ammunition, which is also found in Britain. I have seen Assyrian sling stones of about 2Â¼" diameter, which were carved into a rough sphere. Almost no ancient slings survive, so archaeology will not help you much, except in the ammunition, which does sometimes survive, and in sculptures. Sculptures show several ways of holding the sling. The Assyrians seem to have one end looped around the wrist. Others (e.g. Greeks) seem to have one end fixed to a finger. All have one fixed end and one free end. 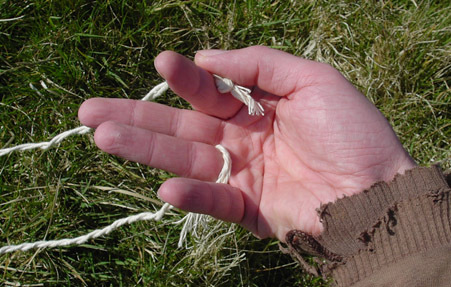 Cultures that used the sling into recent times, such as in parts of South America, tend to have a small loop on the end of the fixed string, for looping around one digit. You could do what I did: experiment. I was fifteen or sixteen when I made my first sling. The ancients would have experimented too, and quite quickly come up with a sling which suited them. There is no point in making a sling exactly the same as the one used by a man two-foot shorter than you. The length of the string will depend partly on you: the length of your arm, and your style of slinging. So, try several lengths of string, until you get the best performance. Not all slings were leather. Many were woven vegetable fibre. I used leather for the cup, and vegetable fibre string for the strings. You can still buy that in ordinary shops. I've tried twisted strings and plaited strings, and found that both work fine. My hand sling is two-ply twisted, and my staff sling is three-ply plaited. The plaited string is less given to tangling, and a bit stiffer, so I'd definitely recommend that for the staff sling. You may want to try rougher and smoother leather. A lot of leather has a rough side and a smooth side, so a good idea might be to make a cup out of such leather, and try it both ways round. The cup must cup around the stone, so a small flat square is no good. Make the cup a generous size, and then cut it down later if need be. For my staff sling, I made the leather cup-shaped with a couple of sewn seams, but for my hand slings, I found that the leather took on the cup shape from use, and from being stored wrapped up in a bundle. My hand sling: a roughly oval/diamond-shaped piece of leather, about eight inches by four, with a short string about 20" long. The two strings are attached through holes (two per string, punched out with a tool for making holes in belts) in the ends of the cup. The strings are separate from each other. I did not use one continuous string. I think that this is the better way. I have also made a hand sling with longer strings (34"), but this is much harder to use. The longer you make the strings, the less effort you need to sling a long way, but the more awkward the weapon is to use. If I stand on level ground, with my arm about forty-five degrees downward behind me, and my back leg bent slightly, the cup of the sling is just off the ground. To use a longer string, I'd have to stand with a drop/pit behind me, or use the weapon with a very different action. I confess I have not experimented much with narrower sling cups. It could be that a narrower cup, as preferred by some, would release the stone with less friction, but I would worry about its holding the stone until that moment less reliably. One common design of sling involves woven fibres that make up the whole of the sling - cup and strings - in one piece. Instead of a wide cup to hold the stone, the string widens and then splits into two or three parallel strands, which then merge again into the other string. With a stone loaded, the separate strands have gaps between them which are large enough to hold the stone, but small enough not to permit it to slip through. I have not used such a sling, but imagine that it would be a bit more difficult to use, but very effective. If you use rough-surfaced stones, these will tend to grip the cup and leave it too late, and smash into the ground in front of you (or, if you are using side-arm, they will go sideways, which is dangerous, so start with an over-arm technique). If you use stones from a river, with slime on them, they will tend to leave the sling early and go high in the air, and land two paces in front of you. I have always found that the stones have some forward motion in them after leaving the sling, so if you cannot see where your stone went, do not walk forwards, and make sure that your spectators are all behind you. A sling stone of about the right size and smoothness. I find spherical ones to be best, but very rare. Next to it is a curiosity I was sent by a fellow slinger from New Zealand. 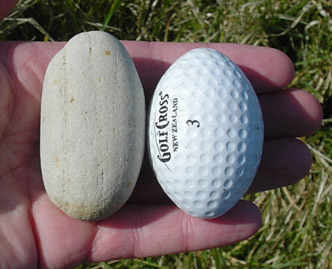 It is a "Golf Cross" golf ball. It is about as fat around its middle as a conventional golf ball, but elongated. It weighs 49g, under half what the stone next to it weighs. Personally, I find such projectiles too light to give me any oomph in the sling cast, but this shape happens to be the same as a sling bullet, and these golf balls go far further than spherical ones. 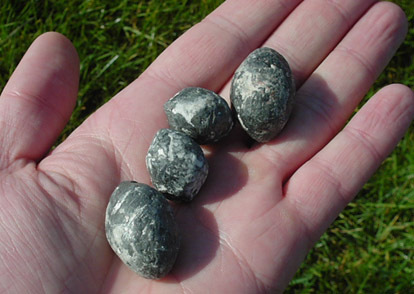 Once you've tried stones for a bit, you might like to experiment with ceramic spheres, and lead bullets. Big lead fishing weights are a very close match for lead sling bullets. Though I have some sling bullets, I have not tried them, because I have no way of finding them again to see how far they went. Perhaps one day I will try them out on a large deserted beach after the tide has gone out, leaving smooth sand. You will pretty quickly find out what a good size of stone is. An apple for a hand-sling is too big. I'd say that one 2" to 2 1/2", a bit bigger than a golf ball, is near the ideal. You'll certainly find that a rounder stone flies truer. Angular ones fly off in unpredictable directions. The longer of the two strings is the one which is fixed. You need the extra length for the fixing. When you hold a loaded sling, the two strings should be the same length. I found that I could fix the string by wrapping it around my ring finger. I tied a knot in the end, for grip, and another knot further down the string, which showed me how much string I had for wrapping. I didn't need to tie the thing to my finger. 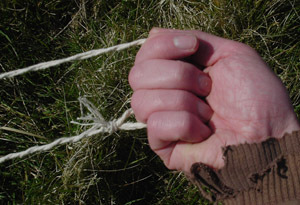 The shorter release string has a knot tied at its end, and this I grip between my thumb tip and the side of my bent index finger. Another simple way to do it is to tie a small loop in the end of the string, but this makes the sling slightly less adjustable. When you sling, you will find that a gentle motion will send the stone quite a way. For power, push off the back leg, throw your body forward (much as you would when throwing a stone) and sling with an arm which starts straight and strains as if to bend, but doesn't bend much. I find the most efficient angle for long range is not straight overhead, but a bit off to my right (I'm right handed), as one is taught to throw a javelin. When you put power into it, you may be surprised by how much of a pull you feel in the fixed string. No one taught me when to release the stone. It came to me quite naturally. I have lent my sling to others, though, for whom it seems to be a conscious effort to judge the moment. I suppose that the moment is just after the strong pull in the fixed string, or when the sling is moving forwards faster than you arm. Either way, it is pretty much at the highest point above you. I now offer you the opportunity to download some MPG movie files of me using my sling on Newcastle Town Moor. I only had four stones, and had to set up a camera on a tripod to get the pictures, as I had no one to help me, so the results are not perfect. I'd have preferred the opportunity for a few warm-up shots, and not to be hurried (my camera only copes with shots a few seconds long). Still, excuses aside, they do illustrate the technique. In both shots, I am using a short sling. My long sling broke, and I have no idea where the stone went. A "long" sling is too long to use in the manner you see in these shots, because the cup would touch the ground, so you need to keep it moving to prevent this. Shows you how long it takes to load a sling. The stone appears to leave the sling slightly before the highest point. Note that my arm doesn't quite go vertical, but a little slanted off to the right, for a stronger cast. I'd recommend going to an empty stony beach somewhere, and slinging into the sea. This is for 1. A good supply of stones, 2. You can see where they are landing (the splashes), and 3. Safety - yours and everyone else's. I was once slinging across a river, and my stone hit a branch of an overhanging tree, bounced, and nearly hit a boy in a canoe. Oops. Really good slingers start young. You will probably never get seriously good. I have seen film of African men keeping birds and other pests off harvested crops by piling the crops in a huge ring, and sitting on a raised platform in the centre of the ring. They stood to use the sling, and used it above the head, rotating it sideways before release. BUT they were putting next to no power in the shot - just enough to scare away the birds, so I wouldn't use this as proof of any technique used in war by the ancients. Palestinian rioters in Israel using slings used them over-arm, I saw on the news. Debates I have read and contributed to on the net have all favoured over-arm technique. I came across an article which dealt with lead sling bullets, being tested by "expert" modern-day Balearic slingers. Some of these competed in the Barcelona Olympics. The tests used two lengths of string, which the article simply calls â€œlongâ€� and â€œshortâ€�. The long string achieved a better range: 15 metres more, or 20 more with an expert slinger. Stones did not go nearly as far as lead bullets. They have much greater surface area and much greater drag, for the same weight. 80 to 90 metres seems to be the furthest anyone can get a stone. With lead bullets slung at a concrete wall 120 metres away, the sling is said to make an impressive â€œimpressionâ€� and make a lot of noise. The average ranges achieved for lead bullets were 112m for bullets between 20 and 40g weight, 121.8m for those 40-60g, 132m 60-80g, and 142.6m for those 80-90g. This is an increase of 10m in reach for every additional 20g. The most commonly used weights were from 60g to 80g. There was a limit of around 100g depending on the strength and arm length of the slinger. I do not find these figures very impressive. 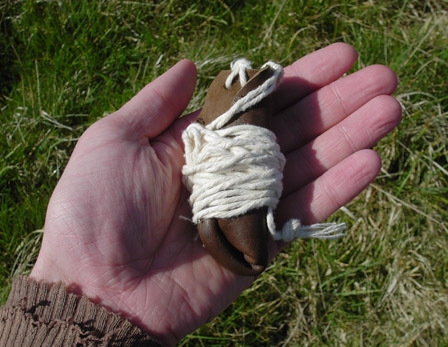 My recent trials on Newcastle Town Moor were far from extensive, as I only had a few stones, and even with large stones picked partly for their whiteness, I usually lost them in the rough grass and the vastness of the Moor. A mediocre shot with a reasonably good pebble went about 84 yards from my short sling. With my longer sling, I was getting over 120 yards with a poor stone. I am sure that with practice I could get much better range with the long sling. I'm told that ancient Balearic slingers would often carry two slings, the unused one worn wrapped around the body or head, one short for short range use, and the other long for longer range. This now makes perfect sense to me. The shorter sling is quicker to use, more easy to use on the move, and more accurate (at least, in my hands). Attempts have been made by members of the Yahoo slinging newsgroup (yes, there is one!) to determine the velocity of sling stones. One guy tried using a traffic speed indicator by a roadside, and found he got 44mph for a thrown stone, and no reliable reading for a sling bullet, which he took to mean that it went faster than 99mph (the limit of the machine's capability). Another guy went to a Royal Ordnance firing range and clocked a fairly consistent 30.5 mps (68mph), but he was not an expert slinger, and could only manage ranges of 150m or so. Everyone I have known report on using this sort of technology has reported trouble with it. It is never set up for slings. For some, you have to shoot the projectile past a tiny window without hitting and damaging the expensive equipment, which is easy with a modern rifle, but not so with a sling. Recently, another sling enthusiast on the net quoted the following: "World record 2.25oz lead weight 477 meters!! (US), 8oz stone, 375 yards (British)". This is more like the ranges quoted for ancient warriors. The American record for the lead bullet used a bullet of typical ancient weight, but the British stone record used a remarkably heavy stone which surprises me. I do not know any of the details regarding these records. It could be that they were achieved with slings or slinging techniques that would be impractical on the battlefield (such as whirling the whole body round and round several times, and using a ten-foot long string). I was sent a video which showed modern Balearic sling users in action. They were concerned with accuracy alone, and not range. Schools had targets in the playground for children to aim at. They had a technique that was a sort of compromise between side arm and overarm. They would make a few slow swirls with the sling going diagonally forwards up and left, then round back right and down, then as the sling came around again, this would change angle such that the stone left the sling at about head height. The free end of the string ended in a long stiff tassel, and from this came the sharp crack of a sonic boom when the sling was released.